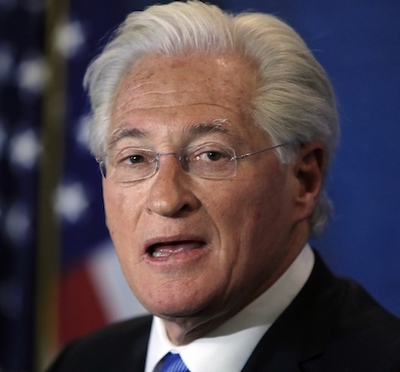 by GOPUSA: President Donald Trump’s lawyer Marc Kasowitz took a victory lap Thursday following the blockbuster testimony of fired FBI Director James Comey, saying the much-anticipated Senate hearing proved what the White House has been saying for months. 'Mr Comey's testimony also makes clear that the President never sought to impede the investigation into attempted Russian interference in the 2016 election,' Kasowitz claimed. Kasowitz, the president's outside counsel who is responsible for looking after his personal interests – not those of the presidency – delivered his statement in writing and orally following the former FBI director's testimony to the Senate Intelligence Committee. The smallish gathering at the National Press Club who heard him speak in person was an unconventional coda to an unprecedented day that saw the White House forced to deny Trump is a liar. Kasowitz instead called Comey a liar, calling into question the memos that comprised the bulk of his testimony. Trump 'never pressured Mr. Comey,' he insisted. Both claims were part of Comey's written and oral presentations. Kasowitz read his statement and left the podium without taking questions. Tags: Trump Lawyer, Marc Kasowit, Opens Up On, James Comey To share or post to your site, click on "Post Link". Please mention / link to the ARRA News Service and "Like" Facebook Page - Thanks!